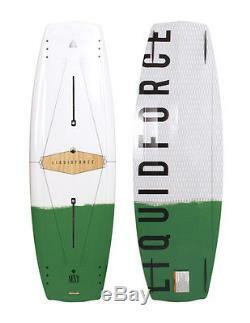 Liquid Force Wakeboard - Next 2017 - Flex Track, Boat Board, Bob Soven Pro Model. Liquid Force Next Wakeboard 2017. If youre looking for speed and quickness in a boat board youre going to love the fiesty pop and responsiveness that the Liquid Force NEXT board brings to the lake! The innovative ash veneer/PU core removes weight and keeps the board extra lively. The Vector Net weave adds a layer of unmatched torsional strength which allows the rider to stay firmly in control of the board when charging off any sized wake. The FlexTrack to make sure your connection to the board is greater than ever, which translates to even more control and better feel. If youre serious about behind the boat riding and want the most aggressive ride possible, this should be your NEXT ride! Length - 53.2 / 135.0cm. Width - 16.7 / 42.5cm. Rocker - 2.5 / 6.4cm. Stance Range - 21" - 25" / 53.3 - 63.5cm. Rider Weight - 80 - 160lbs / 36 - 72kg. Length - 54.8 / 139cm. Width - 17 / 43.2cm. Rocker - 2.6 / 6.6cm. Stance Range - 22" - 26" / 55.9 - 66.0cm. Rider Weight - 120 - 190lbs / 54 - 86kg. Length - 56.3 / 143cm. Width - 17.3 / 43.9cm. Rocker - 2.8 / 6.9cm. Stance Range - 23" - 27" / 58.4 - 68.6cm. Rider Weight - 150 - 230lbs / 68 - 105kg. Order before 3pm for Same Day Dispatch. This product has no reviews yet, however see what our buyers say about our other products.. We therefore recommend you supply us with a deliver address where there will be someone in to sign for the goods and also a contact telephone number. If you do not have these details available then pass on as much information as possible on a covering letter. The Board Basement online snowboarding store was born out of a simple idea - help people fight against the growing cost of doing what we love to do. We are small company but we are all keen snowboarders so we understand what is important - quality gear and great prices. We also have new in season stock for products that always sell out. So we are continually searching and finding the best deals around and then passing them directly on to you, our customers. The everchanging opportunities that come our way mean that where something may not be available one week, it is the next, so please keep in touch. Every week and most days we load new products. The idea came out of another successful business we created called Urban Surfer based in Exeter, Devon; Urban Surfer was well known and respected, not just locally but across the UK and Europe. With this comes over 20 years experience in the Snow and Surf industry as well as years of being boarders ourselves. This means we have a stack load of contacts to get the best deals for you. Treating customers, as we would like to be treated ourselves is one of key beliefs and the foundation of our customer service. The item "Liquid Force Wakeboard Next 2017 Flex Track, Boat Board, Bob Soven Pro Model" is in sale since Wednesday, May 10, 2017. This item is in the category "Sporting Goods\Waterskiing & Wakeboarding\Wakeboards & Kneeboards".